A good few months ago now the lovely Laura from Tease Flutter Pout tweeted about a great offer Manuka Doctor were running, where for the price of postage you got three samples sent to you. Having always wanted to try this brand I quickly leapt at the chance. They sent me the Rejuvenating Face Mask, Age Defying Serum and the Restoring Night Cream, all of which contain bee venom. This hydration face mask offers youthful looking skin due to a powerful combination of natural ingredients including bee venom, vitamin E, shea and cocoa butter. This is a cream face mask and feels almost like a moisturiser when massaged into the skin. It leaves no residue resulting in you being able to potter around the house without any strange stares from flatmates or the postman. I always feel a bit silly wandering around in my clay masks or even the masks which although are clear are still noticeable! This felt like a really hydrating moisturiser and you are supposed to leave it on for 15-30 minutes before washing it off. It left my skin feeling incredibly soft and hydrated. I absolutely love it and will definitely be investing in the full size version, which at the moment is on offer and costs £32.99 here. I squeezed the last drop of life out of this last night and I am so sad that it is now all gone. This serum can be used both in the morning and evenings as is designed to inject life back into tired skin as well as helping to erase fine lines. It is incredibly hydrating due to the Hyaluronic Acid and UMF 18+ Manuka Honey. It has a floral scent that is not overpowering and fades quickly once applied to the skin. It also has a creamy texture but as you massage it onto the skin there is an ever so slight gritty feeling which fades once it has all been absorbed. I definitely felt as though this was tightening my skin and brightening my complexion. It is currently on offer for £16.00 and I think I will definitely be repurchasing it before the offer expires! This night cream follows the same ingredients and formula to work at reducing signs of ageing as the Manuka Honey and Royal Jelly work together to stimulate collage production. This product states that you will wake with soft, plump, hydrated skin and the added ingredients of Rosehip and Propolis will repair damage. This has a thick creamy formula that keeps your skin feeling looked after all evening. I have been using this lots recently and I do feel my skin has benefitted from it. My complexion is bright in the mornings and I absolutely love the results. You can order it for £24.00 for 50ml on their website here or from Superdrug for £16.00 here. 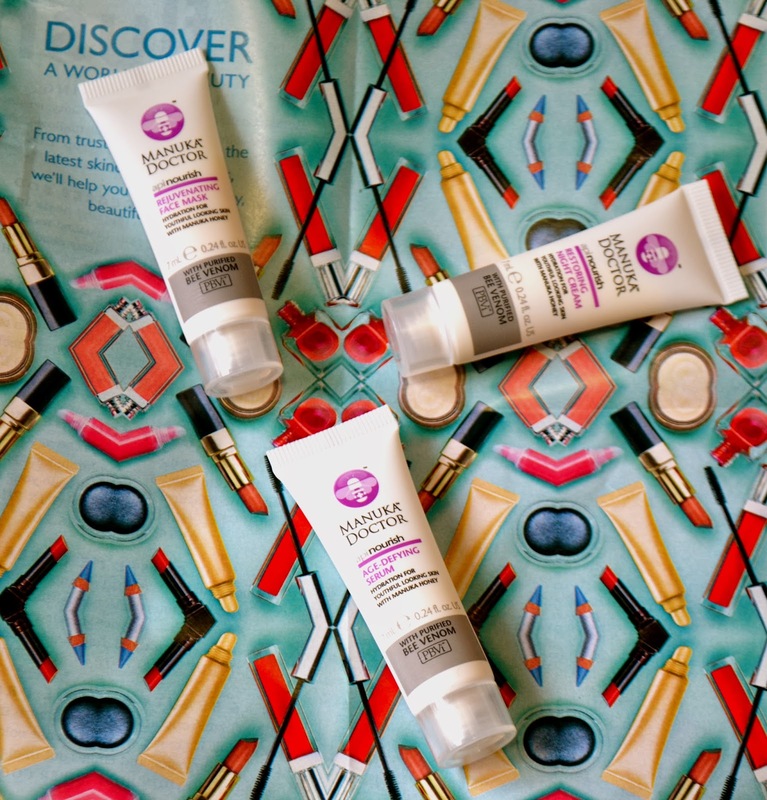 What have you tried from the Manuka Doctor range?